We all know we should eat our fruits and veggies to get our daily required vitamins, minerals, and fiber and to maintain our overall health. However, there is another reason you should be aware of for consuming these health-conscious foods and that is anthocyanins. What are anthocyanins you ask? Anthocyanins are a compound of flavonoids that have proven to be a powerful group of antioxidants. It’s important to consume antioxidants because they not only help protect the body from diseases, but they also help keep you looking good by preventing premature aging. The thought of adding another step to your balanced diet may seem daunting, however, adding anthocyanins to your diet is as easy as recognizing the brilliant colors of your fruits and veggies. Anthocyanins are highly pigmented phytonutrients that can only be found in plants. These plants have long been revered in medicine for their ability to heal and provide a wide array of health benefits. In fact, more and more scientific studies are confirming these findings. For example, cranberries, a brilliant red fruit, are known to help treat and prevent urinary tract infections. Anthocyanins are easy to spot due to their brilliant color. These foods are typically blue, red, or purple in color. Some anthocyanin foods are cherries, eggplant, cherries, mangos, blueberries, raspberries, plums, black currant, asparagus, olives, oranges, figs, radishes, red cabbage, pomegranates, black beans, black rice, kidney beans, beets, and red-fleshed peaches. It should be noted, however, that there might be some undercover anthocyanin foods lurking about such as bananas. Despite not having the typical red or blue hue, bananas are a great source of anthocynanins. Another way to get your sources is to kick back with a nice, relaxing glass of wine, as wine is composed of anthocyanin-rich grapes. However, just be sure to enjoy wine or any alcoholic beverage in moderation, as the cons can pretty quickly outweigh the pros. What are the Health Benefits of Anthocyanins? There are several reasons why including these bright hued fruits and veggies into your diet is such a good idea. Below, are some of the many reasons why enjoying an anthocyanin-rich diet is beneficial to your health. Rigorous scientific evidence has found that foods high in anthocyanins are great for improving heart health. For example, mounting research is finding that anthocyanins help reduce the risk of heart disease in women. One study in 2013 found that women 18 years or older greatly reduced their risk of suffering from a heart attack in middle age when consuming three or more servings of anthocyanin-rich foods three or more times a week. Another study found that women who consumed anthocyanin-rich foods, such as strawberries and blueberries once a week, dramatically reduced their risk of death from cardiovascular disease and coronary artery disease. Some studies even suggest that drinking red wine had similar affects. It is believed that anthocyanins have such an effect on decreasing heart disease because these foods decrease blood pressure and prevent arterial stiffness. Another way anthocyanin-rich foods are great for your heart is that these foods help to reduce cholesterol. Having high cholesterol increases your chances of developing heart disease or suffering from a heart attack. One study performed by The American Journal of Clinical Nutrition found that incorporating anthocyanin-rich foods into your diet reduced LDL cholesterol (the bad cholesterol) by 13.6% while increasing HDL cholesterol (the good cholesterol) by 13.7%. If you’re unfamiliar with LDL cholesterol and HDL cholesterol, the differences are vast and important to understand if you want to maintain a healthy heart. LDL cholesterol, the bad kind, is a waxy fatty substance that clogs arteries. If your arteries get too clogged with LDL cholesterol, it can result in heart attacks or the development of heart disease. HDL cholesterol, on the other hand, helps to clear up bad cholesterol from the arteries by carrying it to the liver, which will then filter it out of the body. It’s important to get enough HDL cholesterol as it helps to prevent the development of heart disease and prevents the onset of heart attacks. It shouldn’t be any surprised that a diet comprised of healthy fruits and veggies is a catalyst to a healthy diet preventing obesity. One animal study found that mice fed a diet enhanced with anthocyanins didn’t gain as much weight as mice fed a fatty diet absent of anthocyanins. Although a controlled human study needs to be performed to confirm these results, it’s obvious that engaging in a diet low in fat but high in fruits and veggies is good for you and your waistline. One way to fight oxidative damage– a catalyst of rapid aging and impaired memory– is to consume antioxidants. Anthocyanins, a powerful antioxidant, are a great way to slow age-related degeneration of brain function and memory. One study found that women over the age of 70 reduced staved off brain degeneration by 2.5 years by incorporating such anthocyanin-rich foods as blueberries and strawberries into their diets. For those of us who haven’t quite reached the golden years yet, eating an anthocyanin-rich diet enhance the learning process and boost overall cognitive function. For instance, one animal study found that rats fed an anthocyanin-rich diet performed better in memory-related tasks as opposed to the mice that didn’t engage in an anthocyanin-rich diet. Now that cold and flu season is among us, we need to do everything we can to keep up our defenses. Elderberry, a fruit high in anthocyanins, is commonly used in herbal medicine to treat cold and flu symptoms. One study found that the anthocyanin content in elderberry mimicked the effects of Tamiflu. Another study found that anthocyanins inhibited the H1Ni swine flu virus from infecting host cells. Time to load up on elderberry and other anthocyanin-rich foods! Preliminary studies are promising that anthocynanins may be an effective way to prevent the development of several different forms of cancer. One animal study performed at The Ohio State University found that berries fed to rats helped to inhibit tumor growth in the esophagus of rats exposed to carcinogens. 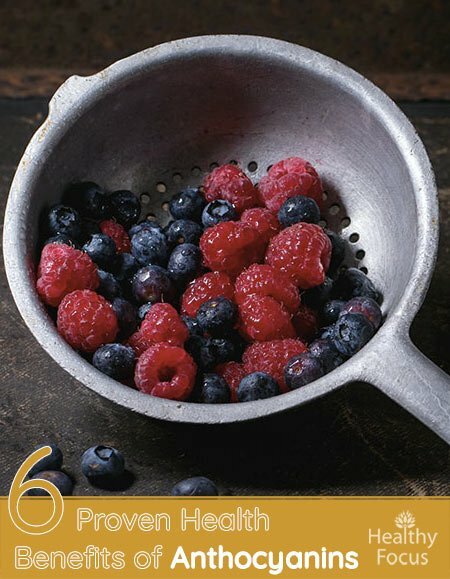 Multiple preliminary studies have found that consuming berries and other anthocyanin-rich foods helped to prevent the development of breast cancer, prostate cancer, colon cancer, and oral cancer. Another study found that regularly eating foods high in anthocyanins prevented the spread of tumors and even inhibited the spread of certain cancer cells. It’s believed that anthocyanins may be effective in preventing cancer because they are a major antioxidant that contains significant anti-inflammatory effects. It’s still not 100% clear as to how this works and more rigorous scientific research needs to be performed to determine the efficacy of anthocyanins as an anti-cancer agent. Incorporating anthocyanin-rich foods into your diet may seem easy enough, but many people find the task daunting. From which foods to incorporate to serving-size. In fact, it’s widely known that regularly eating a diet rich in fruits and veggies is the key to good health and weight loss, yet many of us struggle to do it. One easy way to ensure that you’re getting enough anthocyanins in your diet is to eat three servings per week. It’s as easy as snacking on your favorite berries, having a glass of grape juice or adding such veggies as eggplant or purple onions to your favorite recipes.